We love shooting weddings. Period. 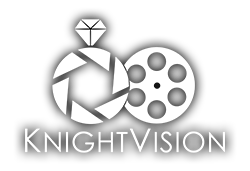 KnightVision started 4 years ago as a Wedding Videography company, adding Wedding Photography soon after. Owner and lead photographer and videographer, Tyler Knight, started KnightVision with one goal in mind. His vision, to create beautiful memories of one of the most memorable days of a couple’s life. This vision has driven Tyler to take on several other talented individuals in order to provide the highest level of service. With a combined 12 years experience in wedding photography and videography, rest assured that the team at KnightVision will capture your special moments in the highest quality. With creative angles, timeless editing, and the latest equipment, your memories will last a lifetime with KnightVision. The KnightVision Weddings team brings over 12 years of wedding photography and videography experience. Working with KnightVision starts with getting to know each other! A wedding is a special day and requires a working relationship to run smoothly. Lets grab a coffee and hear about your ideas to ensure KnightVision is the right fit for you! Every photo & video is edited using the Adobe suite of post-production tools and delivered online and on usb.